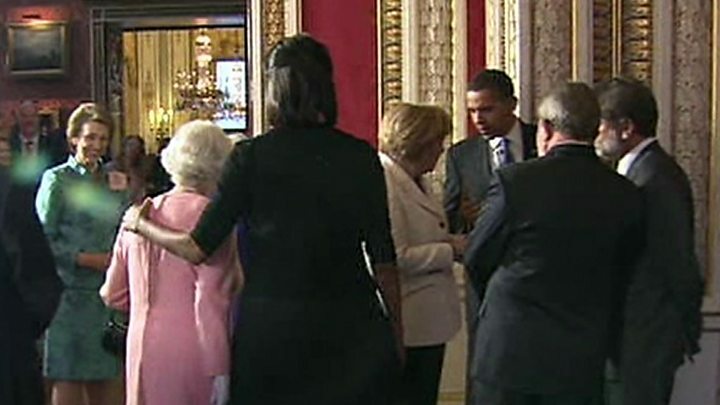 It was described as a breach of royal protocol - but Michelle Obama has revealed the reason why she put her arm around the Queen's shoulder during a 2009 reception. The monarch responded by putting her arm around the waist of the then US first lady as they stood side by side. In her memoir, Becoming, Mrs Obama said they had just agreed a long day wearing heels had left them with sore feet. We were just "two tired ladies oppressed by our shoes", she added. At the time, Mrs Obama's embrace was described by one commentator as "extraordinary", but as she put it: "I did what's instinctive to me any time I feel connected to a new person." The exchange took place on 1 April 2009 when Barack Obama made his first visit to the UK as US President to attend a G20 summit. The Obamas had been introduced to the Queen and Prince Philip earlier. Describing the event, Mrs Obama said the Queen commented on how tall she was and suggested her shoes must be painful. She wrote: "The Queen then glanced down at the pair of black Jimmy Choos I was wearing. She shook her head. "'These shoes are unpleasant, are they not?' she said. She gestured with some frustration at her own black pumps. "I confessed then to the Queen that my feet were hurting. She confessed that hers hurt, too. We looked at each other then with identical expressions, like, when is all this standing around with world leaders going to finally wrap up? "And with this, she busted out with a fully charming laugh." Mrs Obama said that without thinking she expressed her "feelings outwardly". "I laid a hand affectionately across her shoulder. "I couldn't have known it in the moment, but I was committing what would be deemed an epic faux pas."